The All New, All Daring Delusional Honesty! : A St. Paddy's Bonus For The Delusionally Honest: The Incredible Hulk Vs. Justice! 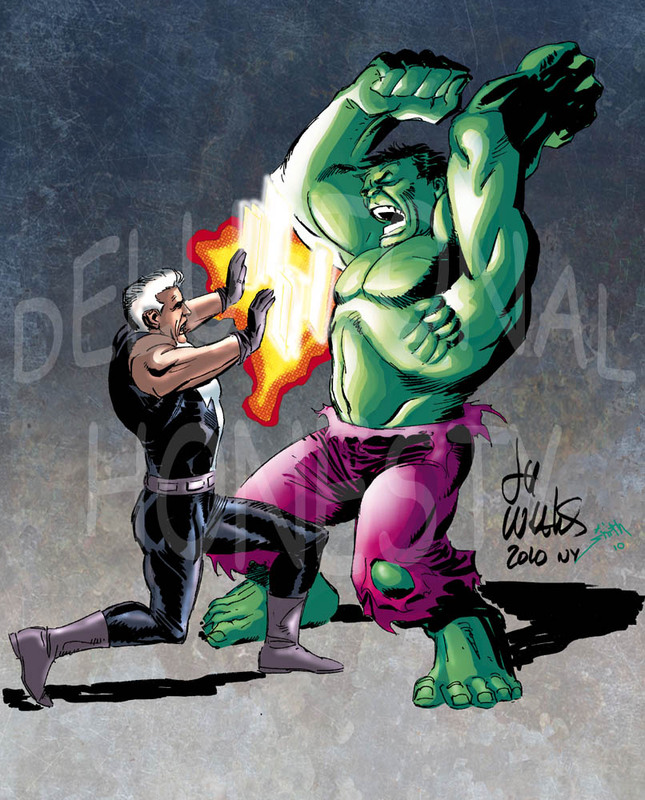 A St. Paddy's Bonus For The Delusionally Honest: The Incredible Hulk Vs. Justice! The story of this piece of original art is quite interesting all by itself. I lucked out at New York Comic-Con 2010 last year when I met Lee Weeks, a tremendous artist who's drawn several of my favorite characters. I thought up this piece when I thought he was going to be attending the Pittsburgh Comicon some years prior. The character on the left is John Tensen, aka Justice from Marvel's failed New Universe line of books. He's one of my favorite characters, and once upon a time I even wrote a fan fiction series based around him, posted on my original website (long ago lost, but I still have the stories). Interestingly, Lee worked on both projects--Justice and The Incredible Hulk--with writer Peter David, so it almost seems fitting to see these two titans pitted against one another here. Stunningly, Lee admitted during his work on this sketch (all done at NYCC) that he actually hadn't drawn the Justice character in nearly as many years as it'd been since the book's cancellation! Lucky thing I had reference for him--reference he'd drawn some twenty years earlier! To the eagle-eyed who actually remember Justice, you might see an error on this piece, as the character is using both hands to erect psionic shields to ward off the fighting-mad Hulk. While it's true that ordinarily, Justice could only project shields from one hand, I think it makes total sense that he'd tax the limits of his abilities when faced with the indescribable dilemma above, don't you? Thanks, Lee. I won't soon forget this occasion. And thanks also to Tom Smith for coloring this gem! Happy St. Paddy's Day, all! Fiction Writers' Corner: "The Final Blow"
At Last: The Monster & The Mercenary! First Hammer Films, Now Some "Vampire Tales"!